By Henk de Villiers Ferreira, The Halfway House near Wadebridge. 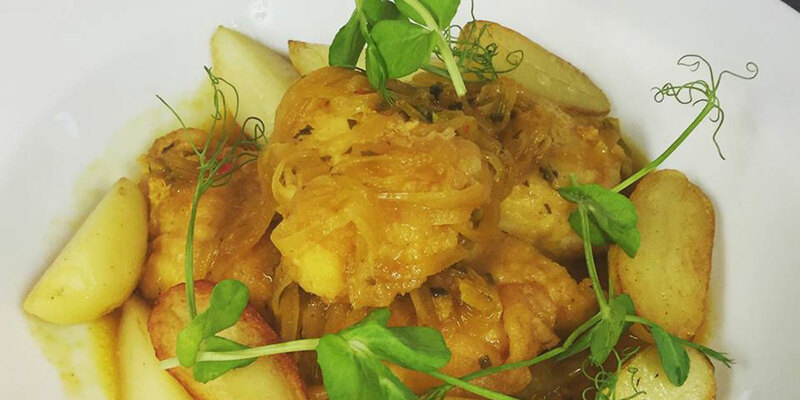 Cape Malay Pickled Fish This recipe is a traditional classic in Cape Town, South Africa. It is served with freshly baked bread and can be enjoyed hot or cold. At The Halfway House we sometimes use this recipe on Cornish Sardines to go as appetizers with our Rosemary and Garlic Bread. Fry the onions and garlic over medium heat until translucent. Add the peppercorns, allspice berries, bay leaves, and red chili pepper. Pour in the vinegar and water and bring to a boil. Stir in the brown sugar until dissolved. Season with curry powder, turmeric, cumin and coriander. Taste and adjust the sweetness if desired.